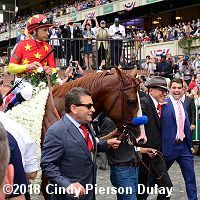 Justify with jockey Mike Smith walks down Victory Lane after winning the Belmont Stakes to complete the Triple Crown sweep. 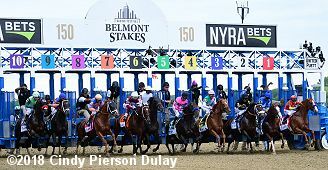 The $1.5 million Belmont Stakes (G1), contested at 1 1/2 miles, one lap of the Belmont Park main track for 3-year-olds, is the third jewel of the Triple Crown, with the sell-out attendance of 90,327 enjoying ideal racing weather, under mostly cloudy skies and a post time temperature of 67 degrees. As was done in 2015 for American Pharoah, attendance was capped due to Justify's attempt at the Triple Crown sweep in the 150th renewal of the "Test of the Champion". 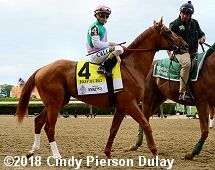 As expected Justify was sent off as the 4-5 favorite in the field of 10, exiting wins in the Santa Anita Derby (G1), Kentucky Derby (G1) and Preakness Stakes (G1) and undefeated in his 5 lifetime starts all run this year. 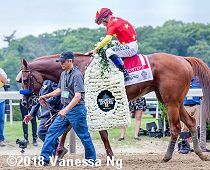 In to challenge him included 5-1 second choice Hofburg, 7th in the Kentucky Derby after finishing 2nd in the Florida Derby (G1), and 15-2 third choice Vino Rosso, 13th in the Kentucky Derby (G1) after winning the Wood Memorial (G1). Down the stretch with Justify out front. 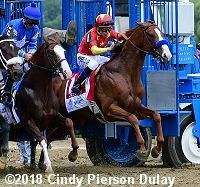 Jockey Mike Smith sent Justify to a clear lead first time past the stands and he set easy fractions of 23.37, 48.11, 1:13.21, and 1:38.09 over the fast track while 2 lengths ahead of 37-1 Restoring Hope and 8-1 Bravazo stalking him second and third respectively. 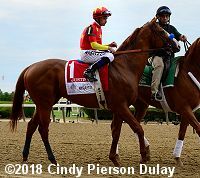 Entering the stretch, Justify continued to hold his 2 length advantage clocking 1 1/4 miles in 2:02.90. 24-1 Gronkowski, last for the first 5/8, came out for room under Jose Ortiz and put in a strong rally past tiring horses but was left with too much ground to make up. 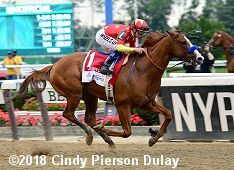 Justify cruised past the winning post 1 3/4 lengths clear, completing the trip in 2:28.18, as only the second undefeated Triple Crown winner after Seattle Slew in 1977. It was another 1 3/4 lengths back to late-running Hofburg third. The victory made Bob Baffert only the second trainer to have conditioned two Triple Crown winners. The first was James "Sunny Jim" Fitzsimmons who trained Gallant Fox in 1930 and his son Omaha in 1935. Left: Justify in the winner's circle. 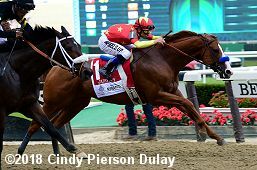 Elliott Walden of co-owner WinStar Farm said, "Grateful to have a horse like this, to have the opportunity to be here, to make history like this is an incredible feeling, and these horses just -- you buy them or whatever, a horse like this just kind of happens. Bob has done a marvelous job with him. Mike has done a marvelous job with him. But we have to have the horse, and Bob made me feel pretty good leaving the paddock. I said, what did you tell Mike. He said, I told him the gas tank is full, don't use it all at once. But just real blessed because you can't find these horses, they find you." Right: Justify heads back to the barn. Teo Ah Khing of co-owner China Horse Club said, "You know, we all heard that Triple Crown is not that easy to achieve, a short three years in America with great partners and great media supporting and reporting, and we are definitely very indebted to everybody here, and we are thankful, even five more minutes for Michael Wallace who together with Tom and Elliott identified this horse in Keeneland, and definitely, I think this effort has reinforced our belief that America is a great place to do great racing, and today is the fruit of that belief, and I'm thankful for everyone. Thank you." Left: The trophy celebration with the Belmont Stakes trophy. 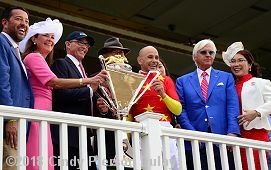 Winning trainer Bob Baffert, celebrating his second Triple Crown after American Pharoah in 2015 (and only the second trainer to do so) said, "It's a privilege to have a horse like this. I mean, it's -- I mean, we're like the coach, but they're the athletes and the jockeys get it done. But to me, when you win the Derby five times, I really felt like, wow, I won the Derby. But this is more to me, I wanted to see that horse, his name up there with those greats. If they're great, they're going to win the Triple Crown. It takes a great horse to win the Triple Crown. To me, I've been through it, there was no excuses. That's why it's so difficult. And even though he had all these races, he's actually just starting to, to me, he's really doing well, and then I was worried about the track because it was getting really deep today. It looked like a tiring track. But the Triple Crown winners, all I can say, they're great." Right: And the celebration with the new Triple Crown trophy. Winning jockey Mike Smith said, "Bob has helped me achieve so many of my goals, but today, man, he made my dream come true. So it was just him and his crew and everyone who works with him, he talks about how brilliant his crew is, and then he just puts an old man out there to sit still, who stays out of the way and lets a good horse be a good horse. That's what I do with him. At different times he wants to move at different places. Then he gets into that rhythm, then he takes a breather, then he goes again. He just kept going; every time I would squeeze on him a little, he just kept going. I was confident he was going to run through the wire pretty strong." 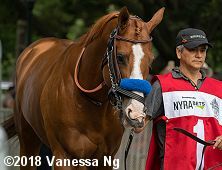 Left: Justify in the paddock before the race. Co-owner Michael Wallace said, "You look back on history, and we obviously haven't been participating here long, but to achieve something like this in such a short period of time is phenomenal. It's been a team effort from a lot of people to get to this point, and a lot of luck. I sort of came here today thinking that we were -- we've sort of won anyway what would be -- if it was meant to happen it was meant to happen, and if it didn't, well, we've still got a great horse and we've got a great run, but this is icing on the cake. This is something everybody will remember forever." Right: The horses break from the gate for the 150th Belmont Stakes. Jockey Irad Ortiz Jr. aboard eventual third place finisher Hofburg (4) said, "I was right there on the far turn, but slow fractions helped the winner. I expected a little more pace early on. I thought I would catch though on the far turn but he's a champion and you knew he would run well. I went for it, made my move at the quarter pole but I couldn't catch him." Left: Justify in the post parade. Smith said, "The whole time he was just so professional. He really was. He was taking the crowd in well, all the noise in the gate. I was worried because the crowd is screaming right in front of you there. Being in the 1 hole, he was standing so good, almost too good. I was a bit worried with my gate, and he reassured me, said, we're okay, he's standing good, trust me, he'll break, and he probably broke better today than he has out of the other two, to be honest with you. He left there today very, very good, which was very important." Right: Justify behind the starting gate. Mike Smith added, "I knew if I jumped well, he's just faster than they are. I knew they were going to send the outside horse, Repole's other horse, WinStar's other horse. I knew they were going to go with a couple. Honestly, I really thought someone is going to hook me, I thought it would be Wayne's horse, Bravazo. I knew they were going to be sneaky aggressive. I just had that feeling. He out-jumped him." Left: Justify shortly after the start. 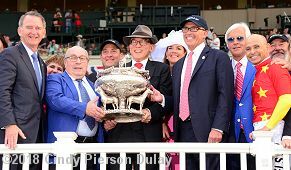 Baffert added, "And I knew the pace, he was going to have to ask him hard away from there and get him in there and get him going in the race. Going into the first turn, we saw those horses out there, and I saw the 23, what is it, 23 and 3, yeah, so that was a little bit, boy, that's fast. But he slowed it down, and I saw 48, felt a little bit better. I was looking, I was talking to Jill, my wife, the whole way, and I said if we can get about a 13.3, 13.4, we're okay, and I think we had 13.1. And then when he made that move in the far turn, I was like, oh, Mike, oh, Mike, don't empty that tank, Mike." 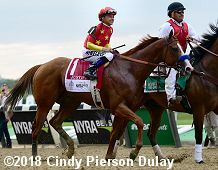 Right: Justify parades after the race. Smith added, "I let him move a little just to open it up so that everyone would move, as well, and chase me. Then by the time they get to me, I'd be able to give him a breather, then he'd move again. He's such a good horse at that. Every time I want him to just take a breather, I just put my hands back down and he'd settle right back down, and if I squeeze him a little, he'll jump right back again. We just kind of kept doing that around the last turn, and then heading for home, I just wanted to wait as long as I could before I really got, really put the pedal to the metal, and he dug back in, and I felt at that point that he would hold anybody off that was coming. 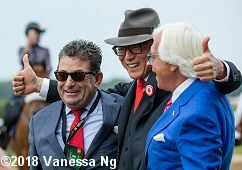 Left: Teo Ah Khing of co-owner China Horse Club celebrates with trainer Bob Baffert and assistant trainer Jimmy Barnes after the race. Ah Khing added, "As I said in the Preakness, the Lord opens the doors, and the doors opened. We are thankful for everybody here and the media and all our friends and especially our partners that we have. We treasure them. As you know, they are about 20 of our members here watching probably at the corridor, and they are on Cloud Nine, and so am I." 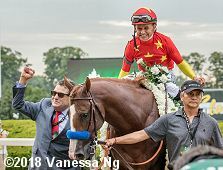 Right: Mike Smith celebrates aboard Justify. Left: Justify breaks from the starting gate. 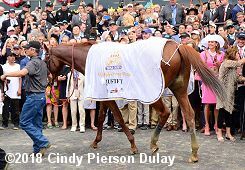 Right: Justify in his flower blanket. Baffert added, "I was watching Hofburg, Bravazo. I thought he'd be tough, because Wayne Lukas, you never know when he's going to just pull it out. And it was just, they were all grouped there. But to me, I was just watching the clock. I just watched the clock the whole way around there, because I knew the clock was going to be my friend or my enemy. You know, he kept it, he kept it, it was quick, quick early, slowed it down a little bit, but when he turned for home, though, I talked to Mike the other night, and I said, I just hope when you turn for home, you're just sitting on him." Left: Second place finisher Gronkowski just after the finish line. 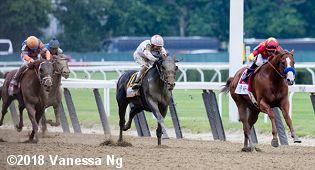 Trainer Chad Brown said, "I'm really proud of the way of the way he ran on dirt with so many things going against him. Then he misses the break, and then there's a soft pace. I was shocked to see him that far back. 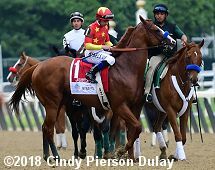 The pace might have been a little slow but [Justify] ran in all three [Triple Crown] races and he won the Triple Crown and went the whole mile and a half today. He showed up and earned it. My thought turning for home was that he [Gronkowski] had a shot to get him [Justify] if Justify was vulnerable at a mile and a half. Even though the fractions were soft for a horse of his caliber, still he had to go a mile and a half. And I thought maybe, because I could see Gronkowski flying, but he just couldn't get to that horse." Right: Third place finisher Hofburg in the post parade. Trainer Bill Mott said, "There was no pace and nobody put any pressure on the horse and he kidn of walked the dog going around there. They were going slow and he said he didn't want to make some crazy move down the backside to go join him, which probably wouldn't have made any sense. Our horse came running. He ran well. I mean, for not having any pace, he finished up very well. I thought at the quarter-pole, our horse was moving and we wanted to be close at the quarter-pole and we did get into position and made a run, but the speed wasn't coming back. They went too slow."